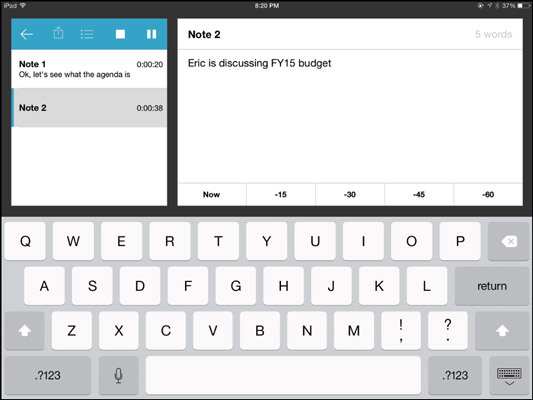 Taking notes is often essential in a work situation, Sometimes you don’t want notes as much as a recording on your iPad, whether for review later or transcription. As the commercial says, there’s an app for that. One great recording app is the $1.99 WaveRecorder. You don’t record notes with it; you record conversations, meetings, lectures, and so on. To start recording, you tap the red Record button, which creates a new “note” and begins recording. If you leave the app to do something else, the recording continues, and you see the iPad’s status bar turn red to let you know that recording is still on. In the screen that appears while you are recording, you see fields for the note title and any notes you want to add to it, such as who attended. 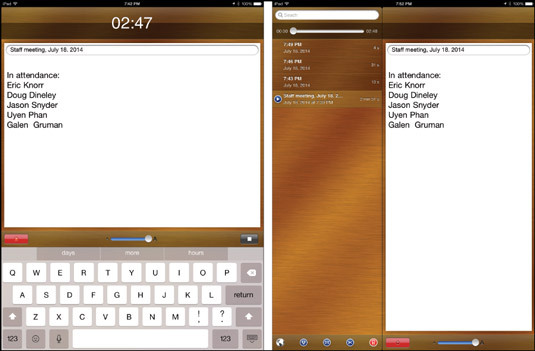 You can type in your own meeting notes as an adjunct to the recording if desired. The WaveRecorder app does not display in landscape mode, so the screen is always in portrait orientation. The text’s default is quite small, but you can increase it to something readable using the Text Size slider at the bottom of the screen. To pause a recording, tap the Record button again. To stop the recording, tap the black Stop button. When the recording stops, you get a screen that lists all the recordings. Tap a recording to see any notes in the window at right; tap the Play button to hear the recording. The scrub bar at the top lets you move within the audio file so that you can skip to other locations in the audio. WaveRecorder saves audio files in Apple’s AIFF format. If you need to convert it to the common MP3 format, you can do so in iTunes. Choose File→Open to import the file into iTunes. Open the iTunes Preferences dialog and click Import Options in the General tab. In the Import Using menu, choose MP3 Encoder. Click OK; then click OK again to close the Preferences dialog. Web Access: Makes the audio recording available to your computer’s browser over Wi-Fi using a URL that displays. Email: Sends the audio file to an email address that you specify. Trim: Lets you edit out portions of the audio file. Delete: Deletes the audio file. WaveRecorder’s developer hasn’t updated the app in years, which is fine except for one aspect: its capability to connect to Dropbox no longer works. WaveRecorder is one of the best recording apps out there, but if you want something more modern, a decent alternative is the 99¢ TapNotes. In TapNotes, you can type in notes as the app records; you can also pause and restart recordings, and keep recording when you’re using other apps. You can even add time markers to your notes so that you can find specific segments more easily later. But TapNotes doesn’t share files as easily as WaveRecorder does: You have to use Open In from the Share sheet to copy the MP4 (not MP3) audio file to a cloud storage service such as Box or Dropbox; then copy, email, or otherwise share it from there. TapNotes also stores audio files in a calendar view, associating them to a date. It’s not so easy to find recordings whose dates you don’t recall, but you can open a side menu that lists all your recordings in one place.